In this article, we explore Chihuahua temperament. It’s time to meet the real dog inside that cute little body! The Chihuahua is a popular and well-known dog breed. It has iconic looks, but does it make a great pet too? Chihuahua ancestry can be traced back over 1,000 years! Their earliest ancestors were called Techichi. Techichi were small companion dogs kept by the Toltec people in Mexico from around 900AD onwards. The Chihuahua is the only breed of domesticated dog that is truly indigenous to the North American continent. Chihuahuas caught the interest of Americans in the mid-1800s. Their popularity soared, and now dedicated breeders work hard to protect the breed. The domestication of dogs is a never-ending work in progress, which has been going on for centuries. And the breeding choices we make directly impact temperament and behavior. As breeders fix a breed’s physical and behavioral characteristics over time, a broadly similar personality starts to emerge. However, research suggests that predictability of behavior cannot be assumed. Many biological, environmental and evolutionary influences affect the reliability of establishing personality in dogs. Regarding biology, there are studies which argue that behavioral genetics are breed specific and persist even in the absence of training or motivation. This suggests that certain personality elements could potentially be controlled, in part, at a genetic level. This, is one of the reasons why it’s vital to meet your Chihuahua’s parents before adopting your Chihuahua puppy. The Chihuahua temperament is typically alert, lively, confident, courageous and self-reliant. Chihuahua puppies have big, confident personalities and are mostly indoor dogs. Some owners describe Chihuahuas as having an almost terrier-like temperament. While many of us perceive the breed as being feisty , Chihuahuas are also loving and devoted to their owners as well. Short-haired vs long-haired Chihuahua temperament? Short-haired Chihuahua temperament and long-haired Chihuahua temperament are so similar as to be indistinguishable. The long-haired Chihuahua personality is big and confident, much like their short-haired cousin. Deer head Chihuahua temperament is likewise the same as their Apple head friends. For all Chihuahuas, their temperament is determined by their parents, training and experience with you. For example, when dog owners resist forming attachments to their dogs, the dogs are more likely to develop separation-related disorders. In other words, temperament of sociable pups suffers when they don’t get the opportunity to give the companionship they were bred to deliver. Does the Chihuahua temperament have any character flaws? No dog is perfect, just like no human is perfect. But knowing what to expect means you can anticipate problems and teach your Chihuahua how to behave appropriately from the get-go. For example, a devoted and loyal Chihuahua might also develop guarding habits around his or her human. This can result in growling and sometimes even snapping. Furthermore, a 2008 study at the University of Pennsylvania found that Chihuahuas are one of the most aggression-prone breeds. That aggression led to attacks on strangers as well as the owner’s family members. And according to a 2010 study in Tokyo, one of the most frequent behavioral problems veterinary behaviorists are consulted on is canine aggression. The key to addressing Chihuahua aggression is proper training and socialization from puppyhood. As with many breeds, patience and persistent are key to successful training. Treat new puppies and rescue Chihuahuas the same. Older rescues should be given the same understanding and patience as a newborn pup. Chihuahuas are very intelligent and eager to please their human counterpart. Which means they respond well to positive training techniques using treats and rewards for good behavior. Temperament is only partly passed on from parent to offspring. It is also influenced by experience and socialization. Thorough socialization in puppyhood is the key to a friendly Chihuahua dog. Your Chihuahua puppy should meet all the people, animals and environments they need to handle confidently as an adult. These encounters must be supervised, fun, and full of rewards for good behavior. Socializing your Chihuahua puppy includes taking them with you everywhere for the first month after arrival. Proper socialization at a young age improves the chances of your little Chihuahua pup growing into an upstanding an polite canine citizen. Chihuahuas do well in grown up only households and families with older children. They are not generally recommended for families with small children. This is partly because a boisterous young child is more likely to push a Chihuahua’s patience too far, resulting in a display of aggression to get them to back off. 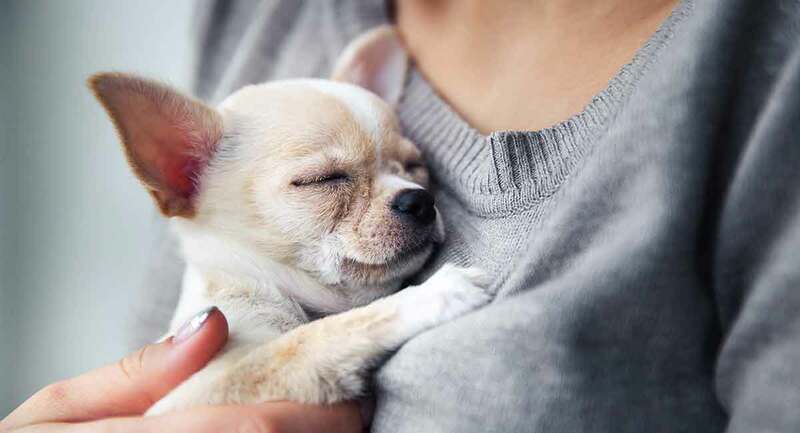 Furthermore, with them being at risk of injury because of their size, young children are more likely to accidentally hurt a young Chihuahua pup. Another thing to consider are Chihuahuas’ loud barks, which is great for intruder alarms. However, it may not make your neighbors happy. But if you have the time to invest in a training a Chihuahua puppy and keeping them company, you’ll be rewarded with a dog who gives true companionship in return! Do you think we’ve summed up Chihuahua temperament well? Tell us in the comments box! Adams, J.U. 2008, “Genetics of Dog Breeding,” Scitable by Nature Education. “Chihuahua Facts,” British Chihuahua Club. Coile, D.C. 2000, “The Chihuahua Handbook”. Duffy et al. 2008, “Breed Differences in Canine Aggression,” Applied Animal Behaviour Science. Fratkin et al., 2013. “Personality Consistency in Dogs: A Meta-Analysis,” U.S. National Library of Medicine. Kaneko et al., 2010, “Assessing Canine Temperament Related to Aggression,” Journal of Veterinary Behavior. Konok et al., 2015, “Influence of Owners’ Attachment Style and Personality on Their Dogs’ (Canis familiaris) Separation-Related Disorder,” PLOS.